This is my version of Kazan's sketch #18 from the Two Sketches For You blog. This is my very first submission to their weekly challenge. I have been a fan of this blog for awhile now though. For this Valentine's day card I wanted to try some new colors, other than just the traditional reds and pinks I have been using so far. Of course I could not get away from those colors entirely, but I thought this shade of blue might mix things up a bit. I have a few other Valentine's day cards using non-traditional colors that I will be posting soon enough. 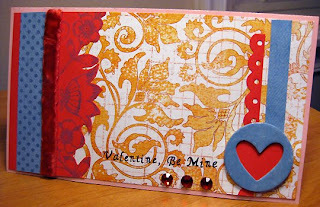 Gorgeous card ~ love your choice of papers and the color scheme you used! Great take on Kazan's sketch! Your card is beautiful! Love the colors you used. Very pretty! Great colors used! you rocked the sketch! This card has pizzaz! Your choice of papers and highlighted colors is wonderful! Loving the non-traditional colors of this valentine's card!! Gorgeous! Great job with the sketch! So pretty! I really love the primary colors! What a fabulous combination of colors and patterns.